The World Meeting of Family draws closer. We can count now the ‘sleeps’ as the children do for First Holy Communion. 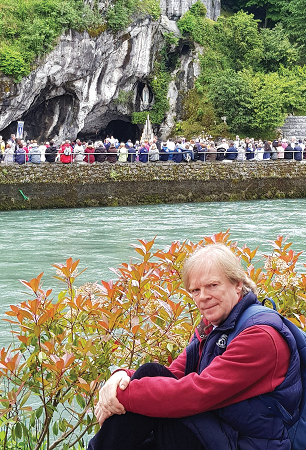 Here in Lourdes this week we have time to pray a pilgrimage of preparation. The world is our home, given to us in trust for our children’s children. It is a time to rediscover the whole world as our home and as a gift. It is a call to live the ideal; to Reduce, Reuse and Recycle. The many accents of our Irish pilgrims speak of our home and our village that gave us our voice and our faith. We are our voices; our accents give us away. On Sunday we celebrated the ‘International Mass’. A thousand people and more, from a hundred countries and more, gather around the table of the Eucharist in the underground Basilica. The best of our Church is often ‘underground’, unseen, discreet, close to the grassroots and to the poor. We listen to the One speak with the accent of Nazareth: ‘I say these things to share my joy with them to the full’ (Jn 17:13). In the gathering darkness and rain, the Torchlight Procession winds its way in a stream of light through the Glorious Mysteries, in many languages, one family in prayer. ‘Sé do bheatha Mhuire’, a soft Irish voice prays in the accent of Tyrone. The candle light struggles to stay alive in the cold rain, a symbol of light and hope fighting the elements of darkness and division. Another terrorist attack in Paris tonight. We walk together out of darkness into the light. The armies of the world arrive. Different flags decorate the Sanctuary, all united in prayer. Armies not in conflict but in solidarity and in peace – a vision of what our world might become someday. The queue for the baths is long and waiting. Illness teaches us the lesson of waiting. Inside the baths, stripped of our clothes, we share our common humanity and vulnerability, the struggle between trust and fear. I share the space with a man from Africa and a man born in India, my brothers with Jesus our Brother. Those who take us by the hand, down the steps into the waters of the bath, may not have our dialect but they speak the universal language of gentleness and compassion. Dressing afterwards the scripture words sing in my ears: ‘You are God’s chosen race, His saints; He loves you, and you should be clothed in sincere compassion, in kindness and humility, gentleness and patience’ (Col 3:12). The young man, William, has the mind of a child and the face of an angel. He has few words. His face is an icon in which we read trust and joy. He truly reflects the face of Jesus for us. William transcends language and difference, reaching out to us all, making us better than we are. Social media is a world of words, a means of communication. Sadly, words meant to build bridges of understanding for the family of the world, often instead build walls of fear and desecrate them with the graffiti of prejudice and condemnation. Thérèse of Lisieux tells this story: ‘On my way home I would look up at the stars. There was a cluster of golden pearls which gave me great joy because they were in the form of a ‘T’. I pointed them out to Papa, I told him my name is written in Heaven. Then I asked him to guide my steps, not looking where I put my feet, giving myself over completely to the star-studded firmament.’ Only a child’s eyes could know such wonder and read her name, star-spangled in the heavens. For more from our July-August Issue, click here.